NEW DELHI, Nov 12  Indians living abroad with alien passports are to be issued a Person of Indian Origin (PIO) card that would confer upon them a range of special benefits, including a visa-free regime and several other facilities in the economic, financial and educational fields, the Prime Minister, Mr Atal Behari Vajpayee, announced here today. 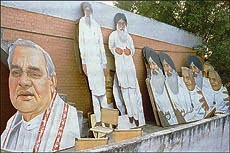 Cutouts of Prime Minister Atal Behari Vajapyee and Chief Minister Parkash Singh Badal being prepared for display at various vantage points in Bathinda. The Prime Minister will lay the foundation stone of an oil refinery near the city on Friday. PHULOKHARI (Bathinda), Nov 12  The Punjab Chief Minister, Mr Parkash Singh Badal, today said he was not aware of any affidavit submitted in the Punjab and Haryana High Court on behalf of the State Government regarding the People's Commission. NEW DELHI, Nov 12  With India today asking Pakistan to cease aiding and abetting terrorism as its proxy war would not succeed under any circumstances, the Indo-Pak talks on the issue of terrorism and drug trafficking today registered limited progress as the two sides stated their respective positions. DHARAMSALA, Nov 12  Jammu and Kashmir militants are planning to strike in a big way in the Tissa sector in Chamba district before the closure of the high mountain passes after snowfall. Copyright : The Tribune Trust, 1998.